Science Research Institute participants Rachel Maurer, front, and Rachel Kesselring examine the shape and structure of mammalian cells under a microscope. Rini Kaneria suspects that a peptide found in wasp venom could break down cancer cells. Kyle Blimline wants to know if DNA extracted from maggots found on corpses could help identify crime victims. And Rachel Maurer works as part of a team developing a way to use 3D printing and bioglass to create custom bandages and heal wounds faster. These researchers aren’t employed by scientific laboratories, academic institutions or medical centers. They’re all teenagers who spend their days attending a rural public high school in Berks County. Their work has drawn the attention of medical professionals at Penn State Health, financial support from cutting-edge companies and invitations to international science and engineering fairs. Adelle Schade, a science teacher at Conrad Weiser High School in Robesonia, Pa., spent the past decade building a program now known as the Science Research Institute (SRI) that engages 130 students in scientific research of personal interest, some of which has patent potential. While pursuing her own graduate work, Schade began bringing what she was learning back to her high school students. She mined professional connections and the local community to build donations of money, supplies and equipment. 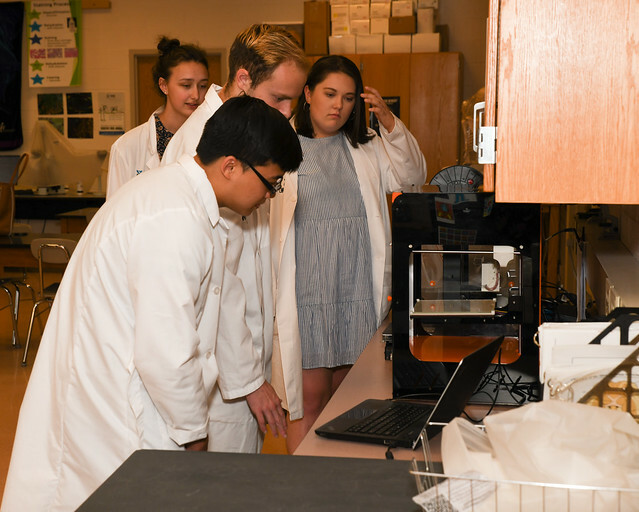 Last year, the school formed a partnership with Penn State Health through which medical professionals and researchers give lectures, mentor students and work together on projects of mutual interest. See photos of the student researchers in action on Flickr. This summer, Dr. Stephen Cyran, a pediatric cardiologist at Penn State Children’s Hospital, will work with some of the teens to study the cardio impact of amusement park visits in children.His personal interest is exercise physiology, so he was intrigued by Schade’s decade of cardiac data from taking students to Hersheypark and the students’ question of whether amusement parks could benefit a child’s cardiac health. “I have read a couple of negative things about rides, but the students’ concept is completely different,” Cyran said. Conrad Weiser sophomore Rachel Kesselring couldn’t wait to join the SRI program after hearing about it from other students. She was excited to get a crash course on reading EKGs and echocardiograms at Penn State Health St. Joseph in preparation for work with Dr. Thomas Chin, chief of pediatric cardiology at the Children’s Hospital. They plan to develop a study to look at the correlation between cardiomyopathy and sudden cardiac arrest in student athletes. Chin said the partnership with Conrad Weiser is an important community service for Penn State Health. “It’s our role as an academic institution to get people involved in and enthusiastic about research and the scientific field,” he explained. Tanya Abbott, pathology manager at Penn State Health St. Joseph, learned of the program when Schade asked if students could job shadow in her community hospital laboratory. Schade plants seeds for the program in students’ regular science classes, encouraging them to ask cutting-edge questions about agriculture, medicine, genetics or environmental science. Students who are part of the institute attend a five-week intensive summer program and work on their personal projects before and after school, on weekends and school breaks. This summer, middle school students will be invited to join the program for the first time. On a recent Thursday afternoon, senior Rachel Maurer scurried down the hallway with a glass bottle of purple goop in her hand, talking a mile a minute about its bandage adhesive possibilities with an excitement typically reserved for the less academic aspects of high school. Other SRI students read medical journals in their free time and watch videos of surgeries on YouTube. Blimline, the senior doing forensic DNA analysis work, said school was never really his thing, but because of the SRI, he has found his niche. “Now, I have something I really enjoy, and I can do some really cool things,” he said. He and others in the program plan to continue their research in college. Some have received scholarships and been courted by universities in a manner typically reserved for athletes. Student researchers, from left, Kyle Blimline, Rachel Maurer, Rachel Kesselring, Rini Kaneria and Madison Bright analyze the DNA of pork and perform cell culture studies. Entry filed under: Features, Research. Tags: Conrad Weiser High School, research, science, Science Research Institute. Hershey Medical Center Neurosurgery gets the gold: hosts Society of Neurological Surgeons	After nearly 200 years of anesthesia practice, are patients waking up safer?